Such fun to be a medieval lady. Or Princess Fiona from Shrek as lots of the kids called me. 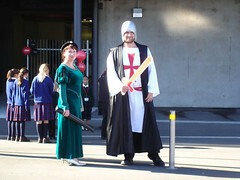 One of the mums asked if that is my job … supporting the Crusaders in dress ups, hmmm. Slightly embarrassed back at work to be admitting Reuben Thorne is kinda cute (not realising a guy in the room’s sister is Reuben’s wife oops). There were bowls of cherrios and they were so yummy, especially dripping in tomato sauce.